Mike and I have had more bacon over the last month than we have over the last year. We’ve gone through two packages (gasp). I’m normally not a huge fan of bacon. When I go out to eat and get a sandwich or salad that customarily comes with bacon, I ask for it without. Or, I pick it out and give it to Mike. But sometimes, sometimes, bacon is exactly what you need. I mean, can you imagine a BLT without bacon? I can’t. To be honest, BLTs are one of the very few ways I will actually eat bacon. I’ve been tossing around BLT variations in my head for a while, but never acted on it. Then, the BLT fairies took pity on me and assigned me this Southwestern BLT sandwich for our “lunch food” recipe swap! This recipe is from fellow Wisconsinite Ashley over at Cheese Curd in Paradise. Bonus: I bought most of the ingredients for this sandwich at the farmers’ market! Win-win-win. Make the mayo: combine cilantro, mayo, chipotle pepper, adobo sauce, and lime juice in a food processor. Blend until smooth. Set aside. In a large skillet over medium heat, cook bacon until crispy. Move to a paper towel-lined plate to drain the fat. Lightly toast the bread, if desired. To assemble: spread chipotle mayo on 4 slices of bread. 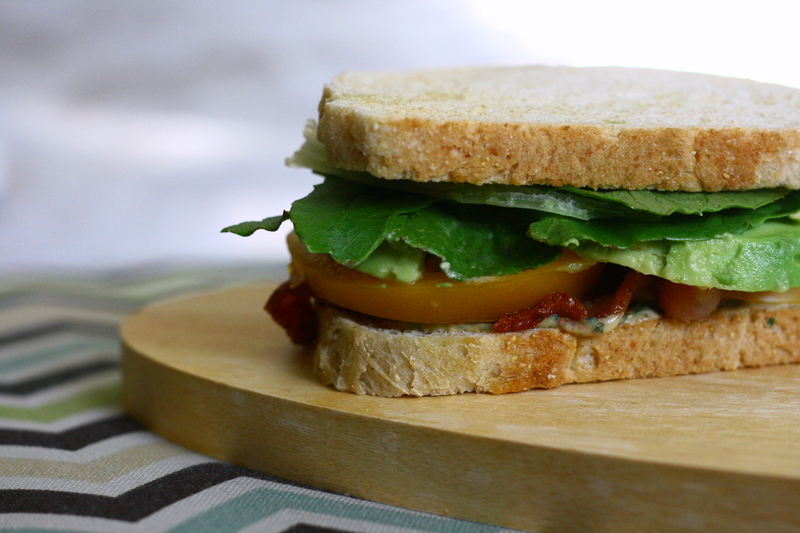 Top the bread with bacon, lettuce, tomato, and avocado. Spread remaining 4 slices of bread with mayo and place, mayo-side down, on the sandwiches. Thanks again to Sarah at Taste of Home Cooking for hosting! Click on the link to check out the other delicious swap recipes! Categories: Dairy Free, Main Entrees, Meat, Money Matters, Pork, Quick & Easy, Sandwiches, Special Diets | Tags: main dish, quick and easy, sandwich, vegetables | Permalink. Is there such thing as too much kimchi? I don’t think so. Or at least I haven’t reached that point yet. Today I have yet another kimchi dish. This time, in sandwich form. Yeah, you read the title right. 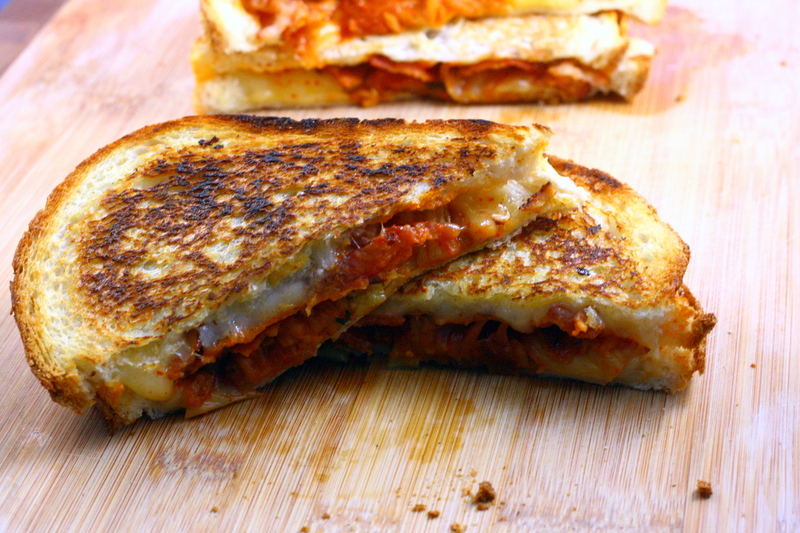 It’s a grilled cheese sandwich with kimchi. Grilled kimcheese. See what I did there? So, this dish doesn’t really need a recipe because nothing is easier to cook than grilled cheese, but… why not? I just had to. Imagine it: ooey, gooey cheese with crunchy, tangy, spicy kimchi. Butter bread slices with butter on one side and place 2 of them in the pan butter side down. Distribute the 1/4 of the cheese onto each bread slice in the pan. Top with 1/4 cup kimchi, remaining cheese, and the remaining 2 slices of sourdough bread, butter side up. Cook for 1 minute or until golden brown and cheese has started to melt. With a spatula, flip sandwiches and cook until other side is golden brown and cheese is completely melted. Serve immediately. Categories: Main Entrees, Quick & Easy, Sandwiches | Tags: Asian, cheese, kimchi, main dish, quick and easy, sandwich | Permalink. It’s swap time again! This is my third swap and I’m officially addicted. The other two times I have participated it was Blogger’s Choice and I got to choose whatever I wanted from the assigned blog. It was kind of nice having a dish just given to me – it means I don’t have to spend hours deciding what dish to make! This time, I got the Prosciutto TBM Sandwich from Does Not Cook Well With Others (DNCWWO). 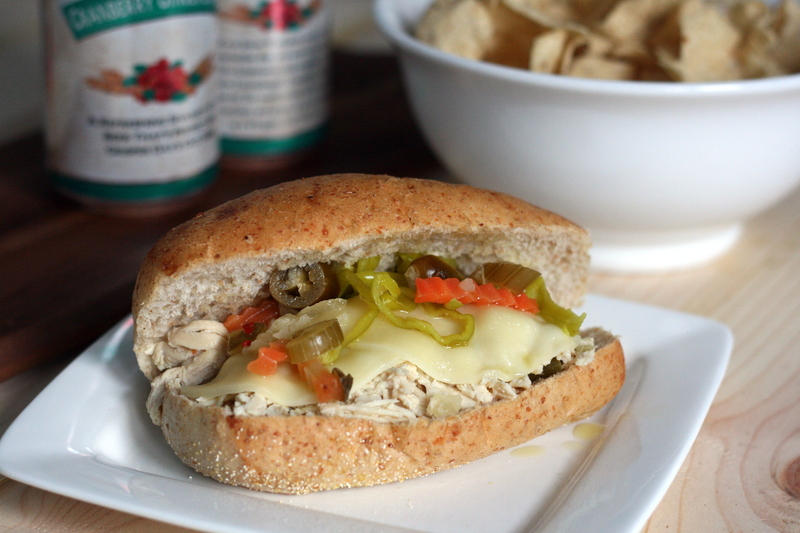 She was inspired by the TBM sandwich at Cosi, a sandwich chain that originated out east. Lucky for me, there was one in Madison, WI as well so I have had the opportunity to eat there. I don’t recall ever ordering the TBM, but next time I’m in Madison I will put it on my must-try list! Slice the loaf of sourdough bread into 6 – 1/2 inch slices. Brush one side of each slice of bread with vinaigrette with a pastry brush. 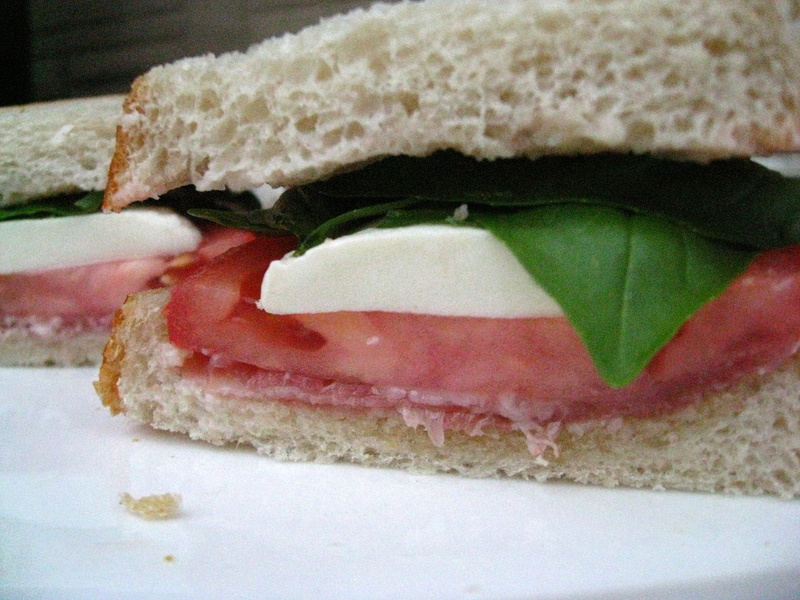 On three slices of bread, layer on prosciutto, mozzarella, tomato, and basil. Place second slice of bread on top. Slice sandwich in half and serve immediately. Categories: Main Entrees, Meat, Pork, Quick & Easy, Sandwiches | Tags: basil, cheese, main dish, quick and easy, sandwich, tomato | Permalink. When life gives you a humongous roast, you might as well use it took cook up something delicious! Slow cooker meals are my saving grace right now. The dietetic internship has been keeping me busy busy busy. I rarely have the energy to cook after a long day of school/work and then a workout. But slow cookers? I can prep the stuff the night before and shove it into the fridge and then have Mike start cooking it at around noon. I’m really digging this system, and it’s so convenient! I skipped the soy sauce in the recipe below (didn’t have any… no idea how that happened!) and just tossed in about 4 sliced mushrooms instead for the umami that soy sauce lends. It turned out great and the sodium levels were cut even more! 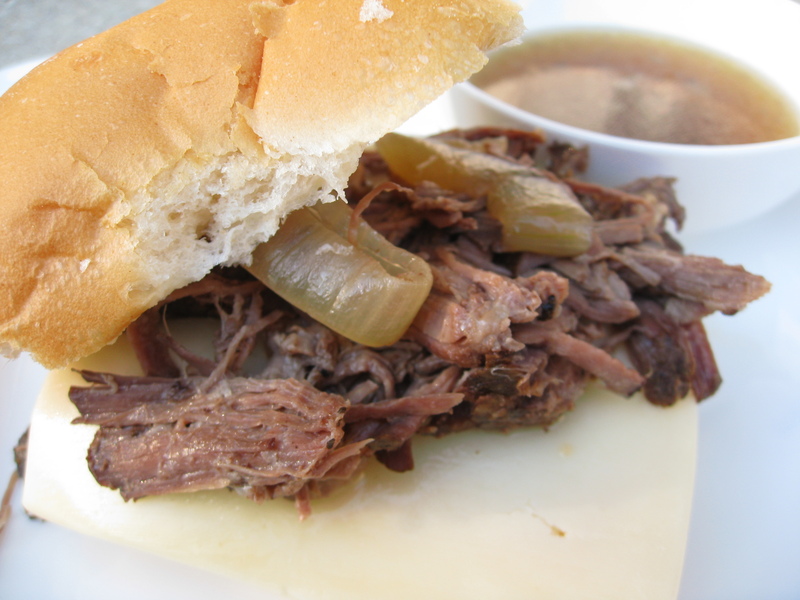 Slice onions into 1/4″ rings and place in the bottom of the slow cooker. Add broth, soy sauce, water, Worcestershire sauce and garlic. Salt and pepper all sides of the roast and place on top of the onions. Cook on low for 6 – 7 hours or until beef is fall-apart tender. Transfer roast to a cutting board and shred with two forksReturn roast to crock pot. Toast bread in oven until just browned. Remove tops of bread and set aside. Scoop beef onto sandwich bottoms and top with a slice of cheese. Heat in oven until cheese is just melted. Top with sandwich tops and serve with small bowls of jus. Categories: Beef, Main Entrees, Meat, Sandwiches, Slow Cooker/Crock Pot | Tags: beef, main dish, sandwich, slow cooker | Permalink. Folks, I’ve never made pulled pork before in my life. In fact, I’ve probably only eaten it a couple of times. I don’t know why the idea of making pulled pork got stuck in my head, but I’m so glad it did. And I’m so glad I didn’t ignore that little voice, because oh my goodness, you have no idea how good this stuff is. It’s so simple – toss everything into a slow cooker, set it, and come back to a delicious heap of tender pork. Take a few minutes to shred it, slap it on a roll, and BAM! Dinner. I made it a little more time-consuming, though, by trying my hand at making my own barbecue sauce instead of using the bottled stuff. I loved the way it turned out, but I would definitely use some Sweet Baby Ray’s if I was ever in a rush. I served it with a side of tangy coleslaw – check back soon for the recipe! Or even better, subscribe or “like” me on Facebook to get instantly notified when it gets posted! To make barbecue sauce, combine all barbecue sauce ingredients in a medium saucepan. Bring to a boil, stirring frequently. Reduce to a simmer and cook for 40 minutes, or until thick. Place roast in bottom of slow cooker. Add in remaining ingredients and stir to combine. Cover and cook on low for 10 – 12 hours, or until roast shreds easily with a fork. Shred roast with two forks. Return meat to slow cooker and cook for 1 more hour. 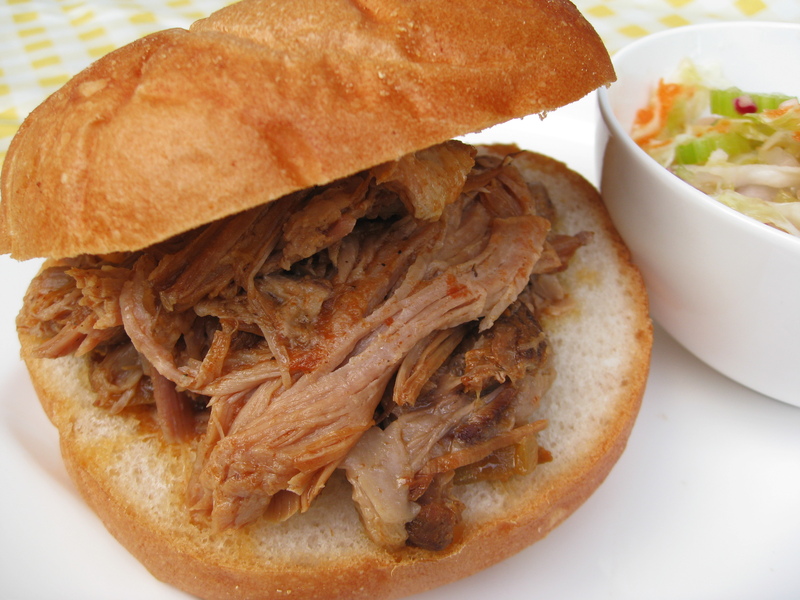 Spoon pulled pork onto kaiser rolls and serve with a side of coleslaw. Categories: Main Entrees, Meat, Pork, Sandwiches, Slow Cooker/Crock Pot | Tags: main dish, meat, pork, sandwich, slow cooker | Permalink.